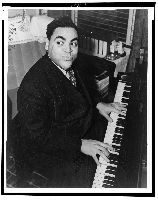 Fats Waller (May 21, 1904 - December 15, 1943) born Thomas Wright Waller was an American jazz pianist, organist, composer and comedic entertainer. He was the youngest of four children born to Adaline Locket Waller, wife of the Reverend Edward Martin Waller. Significance Fats Waller started playing the piano when he was six and graduated to the organ of his father's church four years later. At the age of fourteen he was playing the organ at Harlem's Lincoln Theater and within twelve months he had composed his first rag. Waller's first piano solos (Muscle Shoals Blues and Birmingham Blues) were recorded in October 1922 when he was just 18 years old. He was a skilled pianist, and master of stride piano, having been the prize pupil and later friend and colleague of the greatest of the stride pianists, James P. Johnson. Waller was one of the most popular performers of his era, finding critical and commercial success in his homeland and in Europe. He was also a prolific songwriter, and many songs he wrote or co-wrote are still popular, such as 'Honeysuckle Rose', 'Ain't Misbehavin'' and 'Squeeze Me'. Fellow pianist and composer Oscar Levant dubbed Waller 'the black Horowitz'. Waller composed many novelty swing tunes in the 1920s and 30s, and sold them for relatively small sums. When the compositions became hits, other songwriters claimed them as their own. Many standards are alternatively and sometimes controversially attributed to Waller. The anonymous sleeve notes on the 1960 RCA (UK) album 'Handful of Keys' state that Waller copyrighted over 400 new tunes, many of which co-written with his closest collaborator Andy Razaf. After Waller's death in 1943, Razaf described his partner as 'the soul of melody....a man who made the piano sing...both big in body and in mind...known for his generosity...a bubbling bundle of joy'. Gene Sedric, a clarinettist who played with Waller on some of his 1930's recordings, is quoted in these same sleeve notes recalling Waller's recording technique with considerable admiration. 'Fats was the most relaxed man I ever saw in a studio', he said, 'and so he made everybody else relaxed. After a balance had been taken, we'd just need one take to make a side, unless it was a kind of difficult number'. Musical contributions Waller's touch varied and he was a master of dynamics and tension and release. 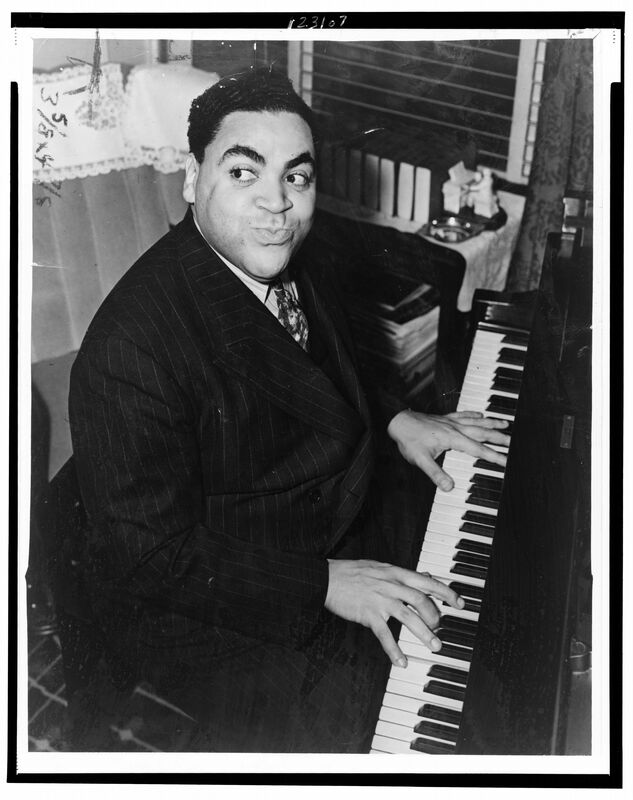 He played with many performers, from Gene Austin to Erskine Tate to Adelaide Hall, but his greatest success came with his own five- or six-piece combo, 'Fats Waller and his Rhythm'. His playing once put him at risk of injury. Waller was kidnapped in Chicago leaving a performance in 1926. Four men bundled him into a car and took him to the Hawthorne Inn, owned by gangster Al Capone. Fats was ordered inside the building, and found a party in full swing. Gun to his back, he was pushed towards a piano, and told to play. A terrified Waller realized he was the 'surprise guest' at Al Capone's birthday party, and took comfort that the gangsters didn't intend to kill him. According to rumor, Waller played for three days. When he left the Hawthorne Inn, he was very drunk, extremely tired, and had earned thousands of dollars in cash from Capone and other party-goers as tips. 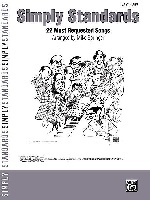 Waller wrote 'Squeeze Me' (1919), 'Keepin' Out of Mischief Now', 'Ain't Misbehavin'' (1929), 'Blue Turning Grey Over You', 'I've Got a Feeling I'm Falling' (1929), 'Honeysuckle Rose' (1929), and 'Jitterbug Waltz' (1942). He collaborated with the Tin Pan Alley lyricist Andy Razaf. He composed stride piano display pieces such as 'Handful of Keys', 'Valentine Stomp' and 'Viper's Drag'. He enjoyed success touring the United Kingdom and Ireland in the 1930s. He appeared in one of the first BBC Television broadcasts. While in Britain, Waller also recorded a number of songs for EMI on their Compton Theatre organ located in their Studios in St John's Wood. He appeared in several feature films and short subject films, most notably 'Stormy Weather' in 1943, which was released months before his death. For the hit Broadway show, 'Hot Chocolates', he and Razaf wrote '(What Did I Do to Be So) Black and Blue' (1929), which became a hit for Ethel Waters and Louis Armstrong. This searing treatment of racism refutes the early criticism of Waller that his creations and performances were 'shallow entertainment'. Waller performed [Bach] organ pieces for small groups on occasion. Waller influenced many pre-bop jazz pianists; Count Basie and Erroll Garner have both reanimated his hit songs (notably, 'Ain't Misbehavin''). In addition to his playing, Waller was known for his many quips during his performances, including: * 'One never knows, do one?' ... * 'No lady, we can't haul your ashes for 25 cents, that's bad business' ... * 'Mercy!' ... * 'Well, all right then!' ... * 'I wonder what the poor people are doing - I'd love to be doing it with them!' ... * 'Run in and stab me, but don't bruise me!' ... * 'Wot's da matta wit DAT?!' ... and - of a large lady vocalist - * 'All that meat and no potatoes!' Waller contracted pneumonia and died on a cross country train trip near Kansas City, Missouri on December 15, 1943. Upon arrival at Kansas City, word of Waller's demise immediately spread throughout the station and onto another train headed west. On that train was Louis Armstrong who upon hearing the news cried for hours. 15 scores found for " Waller "
147 scores found for "Waller"